There are different types of eating disorders, such as anorexia, bulimia and compulsive overeating. Eating disorders can have a negative impact on a person’s health and quality of life. It can also affect the person’s self-image, relationships with their loved ones and performance in school or at work. It can also affect a person’s oral health. 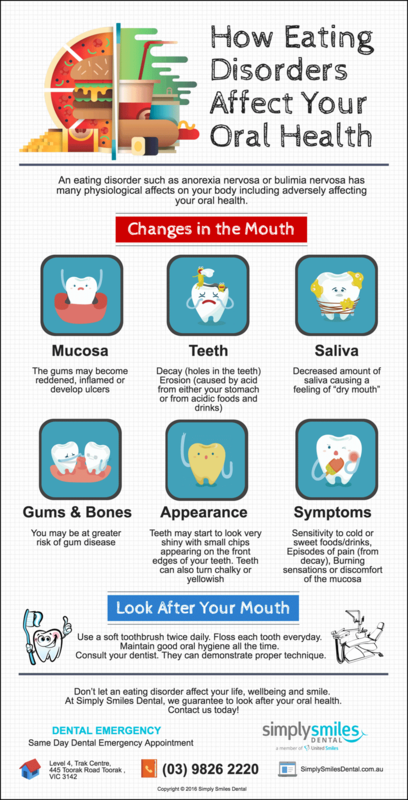 With poor nutrition and eating habits, gums and mouth tissues may bleed easily. The edges of teeth become brittle and thin. If you have an eating disorder, you should be counselled on the need for thorough daily personal oral health care. If you purge by vomiting, avoid brushing your teeth straight away. Instead, rinse with baking soda to help neutralise the effects of the stomach acid. An oral health risk evaluation will also help in identifying other possible treatments. See your dental team for the best advice. If you or your loved one is suffering from an eating disorder, consult your physician in the first instance and your dentist at Simply Smiles Dental in Mernda. Contact us today on (03) 9826 2220 or book your appointment online.